Sneakers, With so many different styles and looks and brands out there, it can be overwhelming when it comes to choosing the right pair for you. Whilst you might want to go for the latest styles and trends, it's important to make the right choice for your feet and your needs in order to avoid pain and injury. 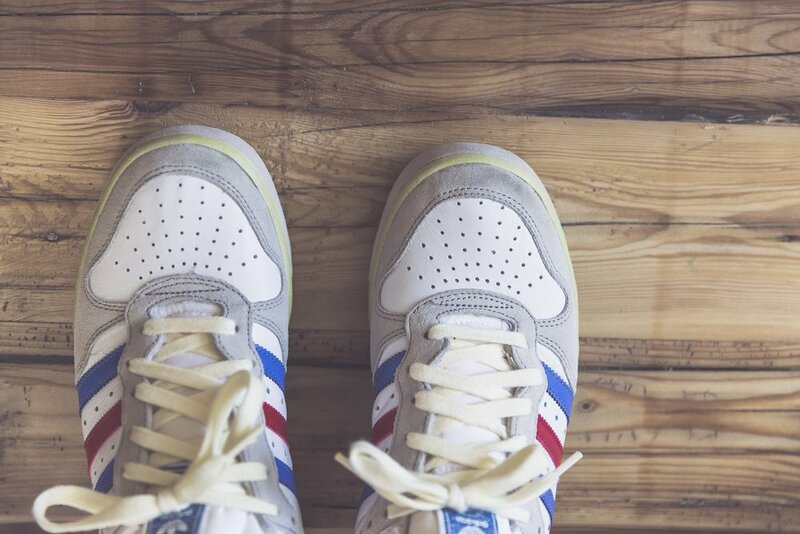 Here are 8 easy tips to help you next time you're choosing a new pair of sneakers! Do you have high arches? Do you feet turn inwards or outwards? Are they super flat or a little on the wider side? Everyone's feet are different so it's important to think about what your own feet are like. If you're unsure, head to a footwear store that can measure your feet and look at how you walk. Good footwear stores will have specially trained staff (and often in store technology) to help you find out the exact quirks and traits of your feet. Also, remember that your shoe size will change from brand to brand and store to store - and it can also change with changes in humidity etc - so you won't always find "your size" is the perfect fit. Do you remember trying on shoes as a kid and having your Mum or the salesperson pressing their thumb into the toe of the shoe to see where your toes were? You should be doing a similar thing now as an adult too. It's important to leave around a thumb's width of space between the front of your big toe and the end of a shoe. The heel should be a snug fit - as should the upper part of the shoe - but it shouldn't feel too tight. As a general rule, make sure you can comfortably wiggle your toes inside the shoe. This leaves room for your toes to move around (avoiding friction blisters) when running or exercising. Think that $10 pair of sneakers is an awesome bargain? You might need to think again. Whilst cheap shoes might be attractive, they may not be well made. Good quality shoes are fairly pricey but worth the investment as cheap shoes may see you with a huge physiotherapist's bill after a few months! And remember, just because it has the Nike tick - doesn't mean it's genuine! Don't be fooled by cheap knock offs. 4: If You Find a Favourite Pair, Buy Another! Footwear brands are constantly changing their styles and fits so my golden rule is that, whenever you find a favourite pair, buy at least one more! This way when your first pair wears out, you know you have another one to go onto! If you wear thick padded socks when you're running, don't try shoes on with thin socks. Your socks will make a big difference to the fit and feel of the shoe - so be sure to try shoes on with the same style of sock you're going to be wearing. Are you going to be running? Dancing? Lifting weights? Doing CrossFit or HIIT? Hiking? Playing tennis? The type of workout really impacts the style of shoe you should be wearing. It might seem like a ploy to get you to buy more - but different shoe styles really are made for different purposes. If you're doing a bunch of different classes at the gym, opt for a cross-trainer. If you love to hike or trail run, go for a sturdier trail running or hiking shoe with lots of grip. If you're doing lots of different activities, perhaps think about investing in a few different types of shoes - like a running shoe, a cross trainer for the gym and a pair of spin shoes - or whatever best suits your workouts. Do you wear your shoes until they're completely falling apart at the seams? Whilst it may seem like an economical choice, you might actually be increasing your risk of injury. The more your shoe wears out, the less it's able to support your feet the way it's designed to. This means you're at higher risk of injuries like shin splints and IT band issues if you're a runner - or twister ankles and muscle tears. After roughly 300 to 500 miles (804 km) of running or walking. After roughly 45 to 60 hours of basketball, aerobic dance, tennis, or similar sports. When there’s any noticeable wear to the mid-sole – the shoes look uneven when they’re placed on a flat surface. Everyone else might have Nikes and you might want to join the club - but they may not be the best shoe for your feet! This is one time where it's really not worth sacrificing anything for fashion - as your health and wellbeing is at stake! Want to find out when it's appropriate to wear sneakers outside the gym - and get some tips for styling your favourite kicks? Take a look at my Sneaker Etiquette Post.